Ayane’s last single ｢十字架に捧ぐ七重奏 (Juujika ni Sasagu Shichijuusou)｣ had its one year anniversary on August 25, 2011, a day after this single’s release. Yeah, we’ve been waiting a while. But the wait was certainly worth it, as Ayane’s singles are usually quite good. 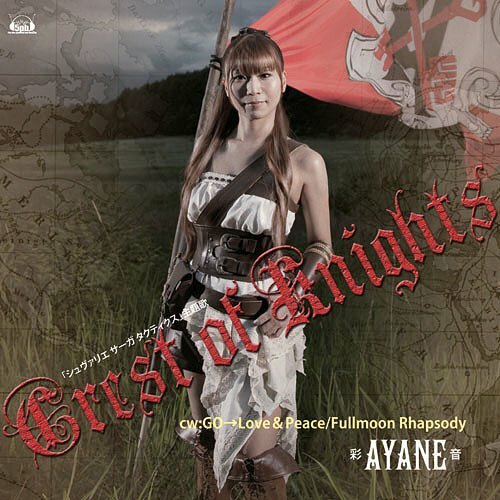 ｢Crest of Knights｣ certainly doesn’t disappoint, giving up THREE songs instead of Ayane’s usual two-song singles. One can draw comparisons with the songs on the single and older songs of hers, but that doesn’t downgrade the songs. It is also worth noting that the cover comes in two version, neither of which are tied into the computer game that the title song is the theme of. More recognition for Ayane and less for whatever anime-related production she is promoting is a good thing. Overall, this single has a nice sample of Ayane’s styles. Great release! The song is like any other recent Ayane single: loud, heavy rock. The piano opening reminds me of her last single’s piano opening. Similar, although I prefer “Juujika…”‘s. The verses have a slightly slower pace than the chorus, which picks up with strong rock instrumentals as many of her A-sides do. It’s a pretty awesome song, and an awesome way to begin a new error, but the last era’s A-sides stand out more to me. Seriously though, her band must be in pain after performing her songs. SO INTENSE! It reminds me of “Nageki no Mori”. Here we get a slower-paced song as compared to the A-side, but I actually like this song more. The music is soothing and somewhat mysterious. I can imagine myself looping this. This has “GRAVITY ERROR” written all over it. Luckily for this song I love “GRAVITY ERROR”. Although not as good as its predecessor, I do like this song. Wicked catchy and cool chorus. Another song I can imagine looping. Fast-paced synth beats are always good in my book. This entry was posted in Ayane, Reviews and tagged Ayane. Bookmark the permalink.